I HOPE YOU ENJOY MR. E ASKS 3: Debbie Diesen!!! Do you have a favorite place to "create" your stories? If so where is it & why? writing part of my mind. Were you involved in the arts as a child/teenager? myself as a writer, then and now. I am very grateful! did you know his story was going to continue? 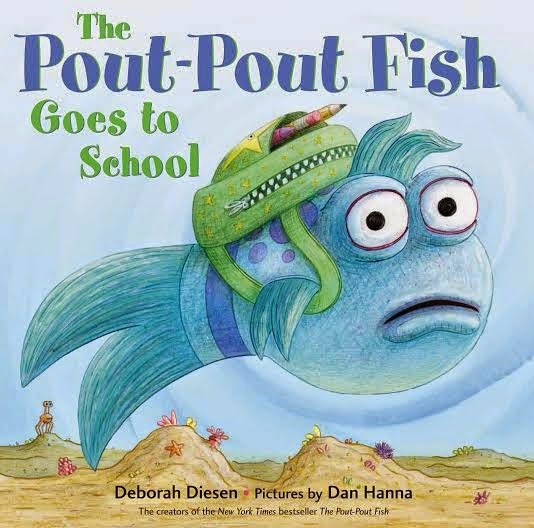 THE POUT POUT FISH BOOKS? Leave a comment with a 2 or 3 sentence description of a fish lesson you use in your classroom! I'll draw a name from those who do this...and the winner will receive a complete set of The Pout Pout Fish Books! Please "Like" Art With Mr. E on Facebook & "Follow" me on Twitter to see if your name is selected!!! My principal reads the Pout, Pout Fish story in an assembly to all our kids at the beginning of the year as part of our fish-themed behavior management plan. Kids can be "Caught in the Act" of doing good things and be given a "fish" reward ticket that earns prizes and rewards for the class. I, of course, got asked to sketch out a Pout, Pout fish coloring page for them to have a contest. As to fish-themed projects, my 3rd graders did a fabulous Gyotaku fish printing unit, where they got a chance to print from one of the rubber fish molds,and then make their own fish design to print by carving into styrofoam. All their prints went onto a crayon/watercolor resist underwater scene background. I'd love to receive some books to continue adding to my art library!! For my fish lesson I have my students create a watercolor resist using texture plates. They fold their paper into 12 rectangles, and color in each section with a different color/texture plate and then cover the paper with watercolor paint. The color is just fabulous, so on the back they will draw a large fish, cut it out, add details to the fish and attach it to construction paper where they create the rest of the scene. This is one of the kids favorite projects to do so it would be great to have another book to use other than The Rainbow Fish! We do a fun lesson using recycled materials to create 3D fish. Students bring in a variety of materials from home to incorporate. This shows them how art can be created from refuse. Fish Prints! I have several sets of the small rubber fish that I use for printing with Kindergarten students. I also have a set of the larger rubber fish for older student prints. Oh and ceramic slab fish. Texture the slab and them roll it into a cylinder, pinching along where the edges meet to form a fin. Pinch the tail area shut and leave the mouth wide open. What has Mr. E been up to? ?